By the end of July, I shall have managed to see all five of Janacek's major works during the current season; but only two of them in Britain. It is extraordinary how rare they seem to be at the moment, with the exception of Jenufa (and even that has been absent from Covent Garden for years). I can't think of any other composer, apart from Mozart and Wagner, who deserves to be more central to the operatic repertoire. I think the Czech may be a problem (someone at Opera North told me they gave Janacek in English because to do otherwise would narrow their casting pool unacceptably). But Scottish Opera has just given us a decent Rusalka in Czech and that sound very idiomatic to me (admittedly, like you, a non-Czech speaker), especially in the comic roles. I'm glad you enjoyed Tomáš Hanus' reading of the score - he led a superbly tumultuous Kabanova which I was able to catch in Oslo last September. I'm very pleased that he will be Welsh National Opera's music director from September, so maybe he'll bring Czech opera more regularly into British houses, albeit not in London. WNO has lovely productions of Vixen (David Pountney) and of Jenufa and Kabanova (Katie Mitchell) which certainly merit regular revival. Incidentally, if you can ever slot it in, I commend to you the current Prague National Theatre production of From the House of the Dead, which I saw a week ago in the course of a rewarding tour of Eastern German and Czech opera houses. I personally wasn't convinced by the staging, but I think it might well have a more positive effect on you. Thank you, Alexander! Especially for the Prague recommendation. I don't really understand the casting issue: surely there must be at least as many non-Czech speakers who have learned or would be willing to learn the roles in Czech as there would be people willing to (re-)learn a Czech role in English...? "What, then, is the problem? Is it simply that the works are in Czech?" No, I think it's something else. 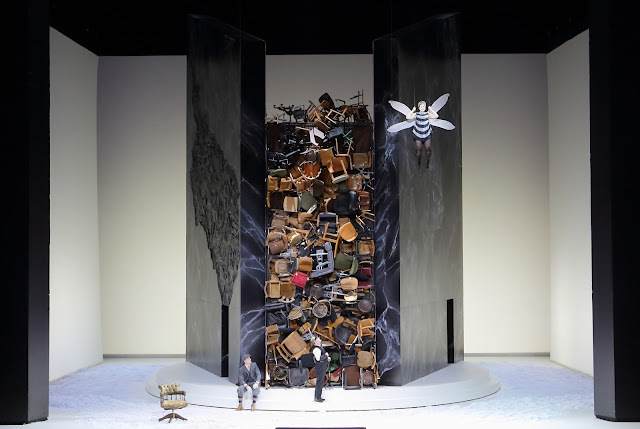 In Janáček's penultimate opera we have art of considerable subtlety, and its effect on the listener is likely to be variable. Many opera fans are still repelled by its rough, declamatory style. In a sense, it takes a gifted listener to make sense of Janáček's jagged, naturalistic rhythms, and his telegraphic melodic style. It requires an agile mind, and a developed ear to respond to its real nature. But, NY Bookfile, I don't think our esteemed host was commenting on the rarity of Makropulos specifically; he was rightly pointing out that Janacek's work overall is rarer than it should be on our stages. Surely the major operas ought to be given pretty much as frequently as the great Mozarts or Wagners? Mark, in answer to your earlier comment, surely it must take longer to learn a role in a language with which one is unfamiliar than to learn it in translation into one's native tongue? To a certain extent, learning to sing Janacek in Czech must mean learning Czech itself, and given that there are only a handful of Czech operas in the international repertoire, it's an investment of time many singers might be reluctant to make. The same applies, alas, to Russian, since really only Boris Godunov, Eugene Onegin and The Queen of Spades qualify as standard repertoire, which might explain why we get intermittent stagings of Cilea and Giordano, but none of Glinka or Cui. The problem must be even worse for languages with only one or two important operas, which may be why it took King Roger so many decades to get to Covent Garden, or why I had to go to Copenhagen to see Nielsen's Saul and David last summer.